There are basically two different types of Takaful models for the management and investment of funds by a Takaful operator, namely, the Mudarabah model and the Wakalah model. Other business models such as Waqf model, Tabarru’ model and combination of models are also adopted by some Takaful operators on a slighter extent. By the principle of Mudarabah, the Takaful operator accepts payment of the contributions from participants on the basis of equity partnership that is a risk-sharing mechanism where the profit is shared between the Takaful operator and the participants in a predetermined manner. The contract specifies how the surplus from the operations of Takaful is to be shared, in accordance with the principle of Mudarabah, between the participants as the providers of capital and the Takaful operator as the entrepreneur. The sharing of such profit is approved by the Shari’ah Supervisory Board for each year; it may be in a ratio 50/50, 60/40, 70/30, etc. as mutually agreed in advance between the contracting parties and depending on the developmental stage of the company. The sharing of surplus that may emerge from the operations of Takaful is made only after the obligation of assisting the fellow participants has been fulfilled. Shareholders of the Takaful Operator as Mudarib bear expenses for the investment activities and the participants as Rab-al-maal bear the expenses for the underwriting operations. Financial losses are required to be covered only by the participants, such as in form of a reduction in of their capital or by paying higher contributions; while the Takaful Operator may only lose its time and effort of labour spent in managing the underwriting operations. Under Wakalah model, the group of participants can delegate their rights or business to the Takaful operator (Wakeel), who then acts as their agent and representative. Shareholders of the Takaful Operator provide the capital to establish the Wakalah Takaful as a donation and do not receive any share of the income generated from investing the Participants Takaful Fund. The Takaful operator assumes the business risk in developing and operating Takaful business on behalf of the participants but never participates in the mutual underwriting losses. It generates its income by charging a Wakalah fee for managing the underwriting operations and investing activities, based on the level of contribution, investment returns and generated surplus. This fee rate is fixed annually in advance and should be approved by the Shari'ah Supervisory Board of the Takaful Operator. All operating expenses are charged to the Participant Takaful Fund, while expenses for the investment activities are charged to the Takaful Shareholders Fund. There is no particular Takaful model that could be considered as the best that exists for both the Takaful Operator and for the Takaful participants. Each model has its own strong and weak points, and none can be exceptionally distinctive from the others as each meets specific needs. Currently different Takaful models are prevalent in different contexts and regions; the basic models being Mudarabah and Wakalah Models. However there are a number of finer combinations of models that exist in practice. It is difficult to judge the degree of qualities of each of these models which all serve their purpose in a definite way. For example, Mudarabah practices are considered better for investment aspects of Takaful fund, while Wakalah is preferred for its risk-sharing features in Takaful operations. In Mudarabah model, the Takaful Operator can share in any operating surplus as a reward for managing underwriting on behalf of Participants. This provides an incentive for the operator to perform proper underwriting, to manage claims carefully and to limit unjustified. Besides, under Mudarabah, the Taka­ful fund belongs to the participants and not the Takaful operator. If there is a loss, participants may lose some of their capital and the Takaful operator loses only in terms of effort. However, some scholars consider that some conditions for Mudarabah may render it inappropriate for application to mutual insurance and risk-sharing. In fact, no profit in form of excess capital is generated from Mudarabah Takaful; it is rather a surplus resulting from collected premiums not fully spent. In addition; Mudarib in Family Takaful may not be free to invest the funds as in a typical Mudarabah arrangements; participants can also choose themselves how to invest premiums into specific funds. By contrast, the Wakalah model distinguishes between the Takaful fund and the Takaful operator (Wakeel), the later charges a fee deducted from contributions made by participants and investment profits; this management fee is related to the level of performance. And since the Takaful operator does not share in the underwriting result, the Wakalah model requires that it negotiates all expenses on behalf of participants to provide the lowest possible costs. All operational costs should be clearly reported to policyholders to guarantee the transparency of all operations and reduce elements of conflict of interest between parties of the Wakalah agreement. However, it is still not confirmed that when this model would be commercially viable when it is fully implemented. Compared to the profit-based previous business models, Waqf, as a non-profit model, would look perfect as it operates on a non-profit basis and utilizes a contribution that comes totally from Tabarru by participants who willingly give to the less fortunate members of their community. Moreover, Waqf is more compatible with the cooperative concept of Takaful as it is created for the very purpose of cooperation for the common good. Similarly, Tabarru business model has a non-profit nature and all contributions from participants are treated as donation. 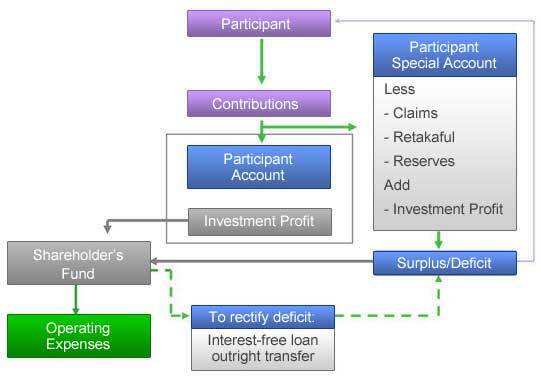 Under this model, there are no returns for the promoters, and for the policyholders. However these two models have some limitations and are restricted to social or governmental owned businesses and programs and cannot therefore be competitive in a global market. Therefore, a refinement of the previous models by combining Wakalah and Waqf models has been evolved to enable participants to employ Takaful Operator instead of being their own managers. As a Wakeel, it collects donations for the Waqf fund, manages the underwriting operations and invests the participants’ funds. The Takaful Operator is entitled to payment of a defined fee and share as, a Mudarib, in the income of the participants funds invested on the basis of Mudarabah. There is also a hybrid Wakalah - Mudarabah business model where the Wakalah contract is used for managing the Takaful underwriting operations and the Mudarabah contract is used on the investment side for the participants Takaful Fund. However, these combinations may also have some features where that can be more effective than others and where they would need to be adapted to the specific context of the Takaful required by participants.